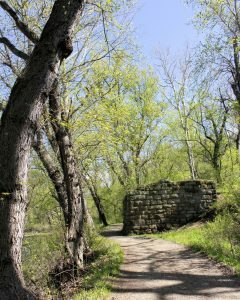 Here sit stone abutments on both sides of the river – the remnants of the Patterson Creek bridge that crossed the river to the town of Patterson Creek. The bridge was built in 1850 but burned down during Confederate General Jubal Early’s raid on February 2, 1864. Lumber was shipped from this area to Cumberland in the heyday of the Canal, and George Washington used the Patterson Creek crossing when he was 16, accompanying a surveying expedition in 1748.